Texas lawmakers pass resolutions all the time. They can make the folks back home happy and commemorate people, places and things. And resolutions can serve — as one did for Senate Republicans this week — as a form of political advertising. Some things just don’t matter unless you pay attention to them. Legislative resolutions, for instance. The Senate had a big day with a resolution this week, passing it after a three hours of back-and-forth on the same day it was filed. It declared a crisis at the Texas-Mexico border. It prevailed by 19 Republicans to 12 Democrats, the full population of the Texas Senate. It took a few hours of discussion. It made some headlines, including here at The Texas Tribune. But it doesn’t mean a thing in terms of law or government finance. It’s easy to file something like Senate Resolution 535 and pass it on the same day for exactly that reason: These things don’t matter, except as a form of political advertising. It’s the Texas Legislature’s version of fist-banging. Hundreds of these things are filed in the House and Senate every session. Some are procedural, setting up caucuses and rules and such. Most of them function as a way for the Legislature to express itself; just thank your lucky stars that nobody has taken up interpretive dance. Look at that number: Senators had filed 539 resolutions by mid-week; the House filed another 1,116. Check out some of the subject lines: congratulating Dr. Michael Miller of Midland on his retirement from Permian Cardiology; congratulating the University of Mary Hardin-Baylor football team on winning the 2018 NCAA Division III national championship; honoring Brian Young of Montague County for his heroism in rescuing a woman after a vehicle accident; congratulating Santiago Mendizabal of Boy Scout Troop No. 3 in Corpus Christi on attaining the rank of Eagle Scout; in memory of Dovie Lee Jackson of Austin and Bastrop. That’s an interesting idea, given the pitch of things in the Legislature right now. Just filing a resolution can be statement enough. 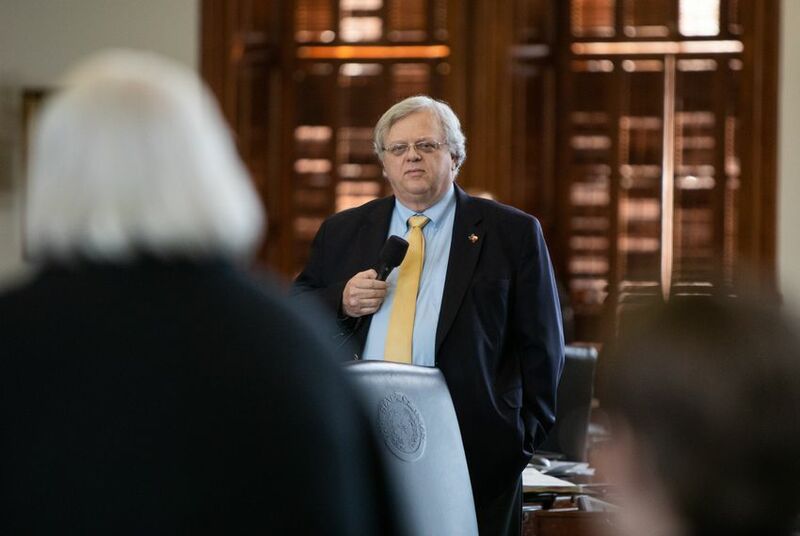 A lawmaker can go home and say she urged Congress to act, or say he tried to make a rhetorical stand on something outside the reach of a state legislator from Texas. They’re important to the people they’re important to, the same way trophies and tombstones and other remembrances are important. Lawmakers recognize constituents this week, honor movie stars and beauty contestants, sports figures and Abel Prize winners, scouts, musicians, you name it. There is a real audience for resolutions: families, friends, communities, fans. And political partisans. Resolutions can be a way — as was the case with the Senate’s latest effusion — for legislators to agree or disagree with something and to get some public notice for doing so. But the seemingly substantive resolutions might have less impact than the congratulatory ones. The kids from Nocona High School who won the Strike Welding Contest in Rochester last year might remember their moment in the Texas Legislature longer than the U.S. Congress remembers what it was implored to do by the Republican women and men in the Texas Senate about the migrants crossing the state’s southern border. RESOLVED, That the Secretary of the Texas Senate forward official copies of this resolution to the President of the United States, to the President of the U.S. Senate, and to the Speaker of the U.S. House of Representatives, and to all members of the Texas delegation to Congress with the request that this resolution be entered in the Congressional Record.